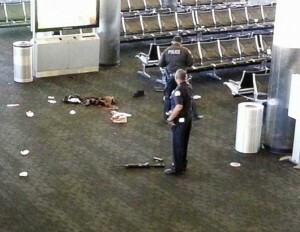 RasRadioLive » LAX Shooting. Another HOAX? Within a few short hours stories changed. At first, the shooter was a disgruntled TSA worker. When suddenly it changed to, the shooter was an angry patriot conspiracy theorist weilding an AR-15. How very convenient for those wanting to impose even more restrictions on our society. Here are a few short videos that further show just how blatently idiotic this entire scenario has become. Is that a DUMMY in the Wheelchair? This fellow just makes it worse. Interesting as well – all of the video of the “event” is from outside. Because we all know, there aren’t any video cameras inside of the airport. Good chance that this is another scam. Just one more step in the effort to take away a little more of your freedom.